Today was the most draining day of hiking I’ve ever had! Top Shelf and I managed to get a good night’s sleep and stayed safe from the rain and high wind advisory. To fully understand this day, I have to explain that there are two ways hikers can choose to enter Idyllwild. The first option is what Speed Bump chose to rest his leg 2 days after Warner Springs. 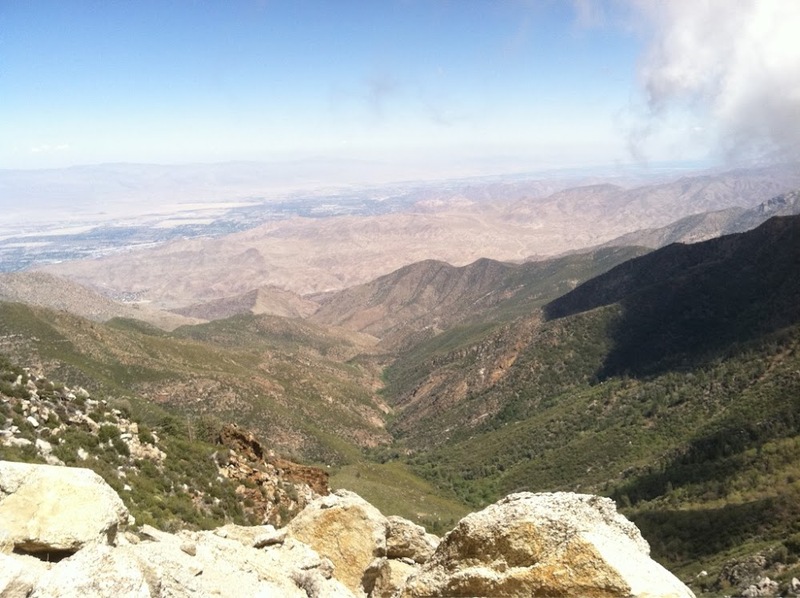 The second option (done by most hikers) includes an extra 4.5mi side trail into town, but is preferable because it has you hiking 4.5 days so that the next gap between Idyllwild and Big Bear City is 5 days instead of 7. Hopefully, that makes sense. The point being that Top Shelf and I knew we had ~30mi to make it into Idyllwild in one day and we decided to get an early fast start to give us the option if we were feeling good. We got started at 6am and headed into our highest elevation yet(over 8000ft). The whole day, we only saw a couple other hikers. We are in this interesting pocket ahead of the herd, but behind the speedsters. We later found out that the winds where most hikers stayed at the night before (but we passed) were so high that many hikers had to go into Idyllwild and take an unexpected zero due to the horrible weather. We were already part way up so there was no turning back for us. We packed up our wet tents and powered on. Within minutes of hiking, our pant legs and shoes were soaked from the wet foliage we passed and our shoes stayed wet the rest of the day. In an hour, we were in the clouds. It was windy and cold. It was in the 30s most of the day as we hiked through beautifully iced over foliage. As we got higher it felt like we had skipped ahead to Washington. The dense fog, tall trees, ice and water on the plants. We joked that we were expecting to see Canada around the next corner. The water sources for this section are mostly off trail and we were trying to limit our off trail mileage. About 5mi in, we stopped at one that was only 1/4mi off trail. Neither of us needed water , but we wanted to camel up to avoid having to go further off trail later. I volunteered to go down the steep trail and filter water for the two of us. I came back up exhausted and cursing because the spring was dry. Turns out a note from another hiker was barely visible under a rock by the sign for the spring. Lesson learned there! We left a much more visible note and decided to see if we could make it 12mi on 2L of water apiece. After 6hrs of difficult hiking we assessed the game plan. We both felt good and were NOT wanting to stay out in this cold, wet, rain in out already cold and wet tents. We decided to push hard to Idyllwild and both got the MP3 players out for increased motivation. Within an hour, the clouds lifted and we were treated to the most amazing view that we had no idea was even there! It was just the motivation we both needed. I had my music playing on random and right when the clouds lifted it had landed on the song, “Defying Gravity” from the musical Wicked. At the height of the song, the music swells and she powerfully belts out, “So if you care to find me, look to the western skies. As someone told me lately, everyone deserves a chance to fly. And if I’m flying solo, at least I’m flying free.” Yep, in that moment with what we were going through and the clouds lifting, I definitely had to hold back tears! Top Shelf was in front of me and turned around beaming to tell me that he was listening on his iPod to his home (Seattle) sports station and how awesome it was at that moment for him. We were psyched and unstoppable. We were both in a zone and driving toward hot showers and a warm bed…until the elevation really hit another hour after that. For most if today’s hike, I would liken it to a never ending stairmaster that just kept getting steeper. Plus add an extra 25lbs to carry. I was almost brought to a halt when we got over 7000ft elevation, which I am not used to. I was barely getting one foot in front of the other and it was so steep that I was barely getting a half step for every step. I was past the point of exhaustion and knew we were pressed for time, but my legs were out of gas. It took all I had to not dump the extra 3lbs of food I had in my pack due to our unexpected speed and food from trail angels. After we got past the highest point of elevation, our exhausted legs had to get through random mounds of deep snow on an off for an hour or so. We passed the water source and neither of us were in the mood to stop so we kept moving. We HAD to make it into town. We finally got to the side trail onto town and our legs found new energy as we bound down the 2.5mi trail to the road. The fog got insanely thick and we could barley see 10yds ahead of us. 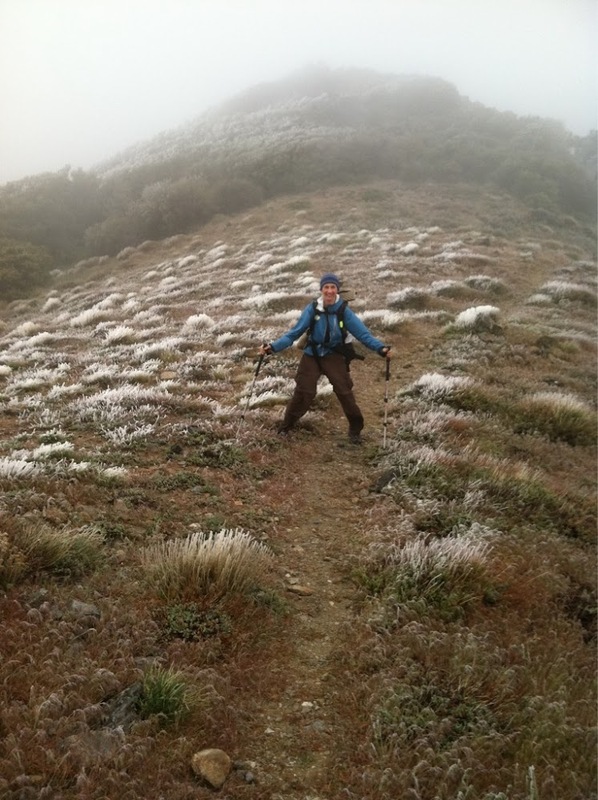 It was hailing/sleeting and we saw other hikers crazily heading up and back onto the trail. They said there was a great Mexican place having a special in town and we really kicked it in because earlier we were talking about how we both wanted Mexican food. We hit the road and hoped for a hitch. No one was out on the roads in this weather and our feet did not like the asphalt. About a mile later, a car drove up and a woman named Sharilyn gave us a ride to the Idyllwild Inn. Surprisingly, Sharilyn had not heard of the trail and I told her to check out my journal so she could know how much her ride meant to us. THANK YOU SHARILYN!!! When we got to the Inn, everything was booked because of all the hikers escaping the horrible weather. We asked if Speed Bump had a room and it turned out he had rented a whole cabin! We gave him a call and our team was reunited. So awesome! we finished the night with some great Mexican food and nice hot showers as the temps dropped below freezing and the hail/sleet continued to fall. What a day! After 13hrs of hiking and 28.3mi, I’m ready to watch my shows and enjoy that zero tomorrow!